London, UK. 14.01.2013. Nameless Theatre presents THE TROJAN WOMEN, freely adapted from Seneca by Howard Colyer and directed by James Farrell, at the Brockley Jack Studio Theatre. Design by Libby Todd. Lighting design by Steve Lowe. 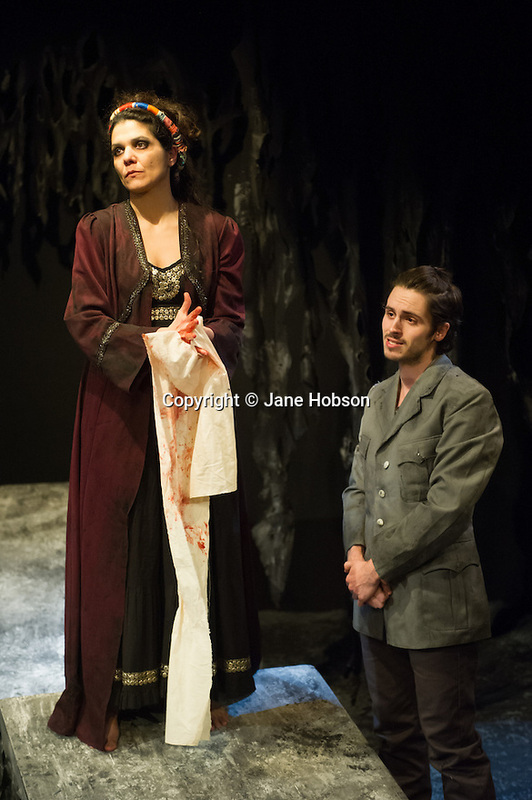 Picture shows: Tania Batzoglu (Calchas) and Edward Mitchell (Pyrrhus). Photo credit: Jane Hobson. Restrictions: Press night is Thursday 17th January 2013. Local copyright law applies to all print & online usage. NUJ newspaper space rates apply. Magazines please call for rates. Not to be published in Guernsey.